Maruti Suzuki, the most favourite and trusted car maker of India has many cars which can boast of large selling volumes in our country. The entry level hatch back segment is the most competitive and best selling category in the Indian perspective. Maruti Suzuki has a range of compact hatch backs models, among which the Maruti Suzuki Alto 800 is one of the most popular cars which carries forward the legacy of the original Maruti 800 which was the most popular cars in the Indian history. 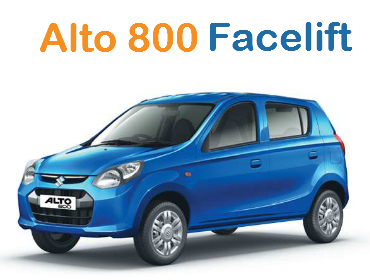 Now with continually increasing competition in the automobile market, this car maker has decided to introduce a face lifted edition of the Alto 800. Alto 800 is undoubtedly the most favourite entry level car in India as well as the best seller from the house of Maruti Suzuki. It comes in two new vibrant colour options namely, Mojito Green and Cerulean Blue. On the exterior, the front profile of this model has also been designed in a new way with restyled head lamps, a new front bumper, redesigned front grille and provision for fog lamps. The side profile of this car has been kept mostly unchanged while the same goes for its rear portion. The wheels come with a new design and the bumper is now 35mm longer than before. In its dimensions, the face lifted version of Maruti Suzuki Alto 800 is of 3430 mm in length which is 35mm longer than earlier version and 1490 mm in width, 1475 mm in height and offers a wheel base of 2360 mm. Inside the car, the cabin has been given certain updates. It now comes with fabric upholstery for the seats and door pads and a passenger side ORVM as standard with additional space for storage in the rear of the car. Full wheel covers, a new rear spoiler, front power windows and central locking system are other standard features on offer. Other upgrades include door trim fabric, keyless entry, head rest for the rear seats, remote fuel lid opener. The new Maruti Suzuki Alto 800 will still be driven by the same 800 cc three cylinder petrol engine which generates 47bhp with 69Nm of maximum torque. The face lifted Maruti Suzuki Alto 800 delivers 24.7 kmpl mileage for the petrol variant, while the CNG model claims to deliver 33.4 kmpl of mileage. New Alto 800 TCO is expected to range around 4.41 lakh for 5 yrs while Alto 800 on road price starts at 2.5 lakh and goes up to 3.70 lakh in Delhi which makes it quite affordable and therefore a hot selling package from the house of Maruti Suzuki.